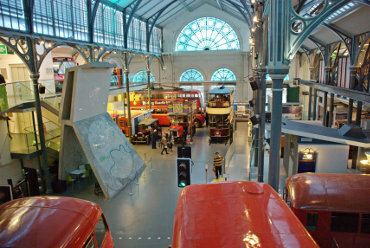 BeenThere-DoneThat: London Transport Museum, Covent Garden, London. 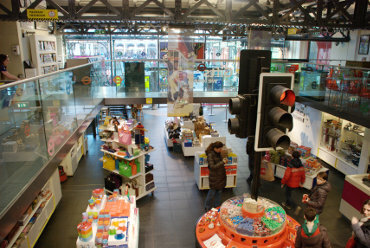 A view of the London Transport Museum in the Covent Garden Piazza. 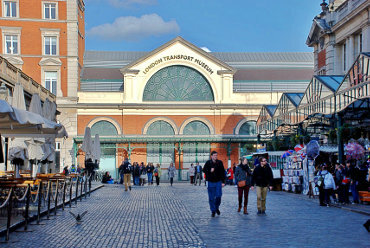 The building used to be the old Flower Market as distinct from the main Fruit and Vegetable Market but now houses the museums collection and has done so since 1979. There is an entrance charge for the museum although entry to the shop and cafe is free. 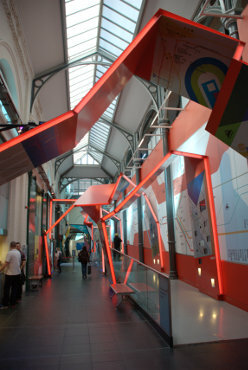 The rather striking World City Gallery, designed by the Conran Design Group, is a walkway into the museum itself and will show how public transport allows cities such as London, New York, Paris, Delhi, Shanghai and Tokyo to stay on the move. It features footage made by passengers that was collected via a call for content made by the museum on Facebook. The Main Hall houses a number of the larger exhibits such as buses, trams and Underground trains. At the far end there is a Trolley Bus, Tram and a bus dating from around 1911. Just below the camera are two more modern buses and in the bottom right is the front end of an older tube train. There is a very good shop with the cafe over to the right. Items in the shop include gifts, souvenirs, models, books, posters, childrens' toys and household items.